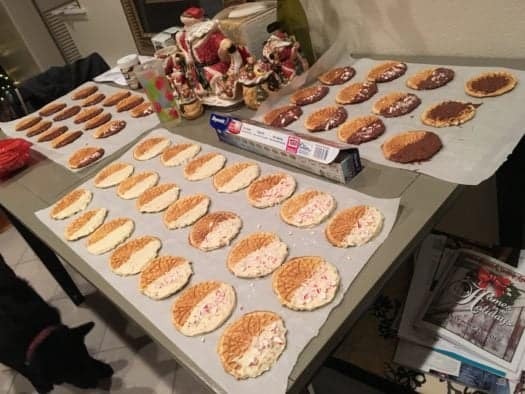 Making pizzelles is a Christmas tradition in my husband’s family. My family has always made tons of homemade cookies and sausages. But since John’s family lives far away, and he misses the pizzelle cookies, we decided to make them ourselves one year. This pizzelle recipe is from my husband’s family and makes so many pizzelles. They are definitely time-consuming to make, but they are so delicious and keep well for a few weeks. In order to make this recipe, you will need a pizzelle maker. We were gifted one by my husband’s mom. 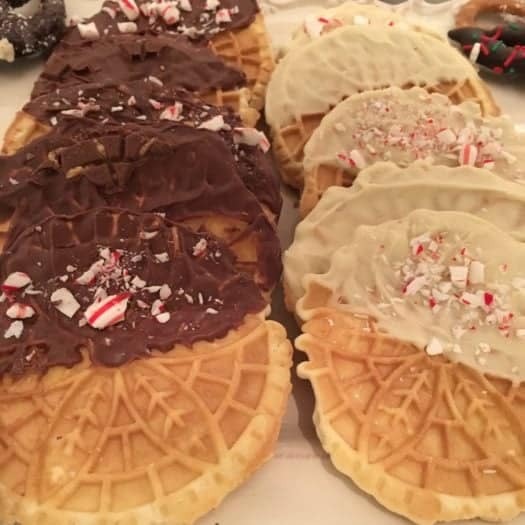 You can also use a waffle iron to make these, but a pizzelle maker works so much better. Beat eggs, adding sugar gradually. Beat until smooth. Add cooled, melted butter and vanilla. Sift together flour and baking powder. Stir into egg mixture just until blended. The dough will be sticky. Drop by heaping tablespoons onto a heated pizzelle waffle iron. Cook until just light brown. Once cooled we decided to dip them in chocolate. We melted dark and white chocolate. Dipped half of the cookie into it and placed them on wax paper to dry. We also crumbled peppermint on some of the chocolate. They are just as delicious without the chocolate, but honestly, who doesn’t love a little chocolate! And the peppermint makes them look extra festive, don’t you think?